South Webster senior Maddie Cook will be a big factor in the Jeeps Monday sectional vs. Piketon. The Jeeps (8-13) meet with Piketon (12-10) in a Division III sectional semifinal Monday evening, taking place at Valley High School. To advance to a sectional final against Eastern Brown on Feb. 16, South Webster must use its size to score in the paint. 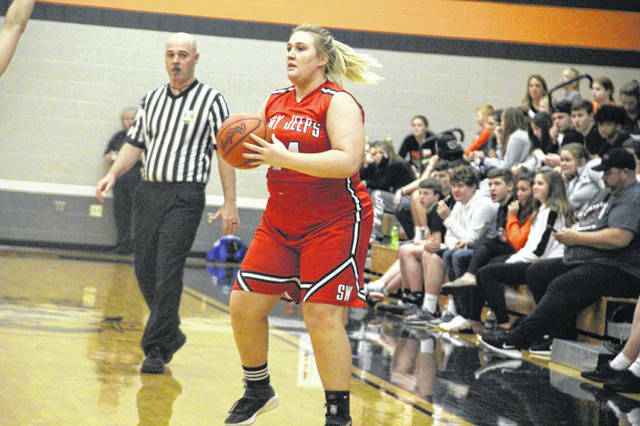 The Redstreaks feature two talented guards in Brianna Odel and Gracie Lightle, who can both score at will when they’re hot. But the one thing Piketon lacks that South Webster has is size, a trait you can’t teach. South Webster’s Maddie Cook, a 5-foot-10 forward, will lead that charge. Cook is the Jeeps’ leading scorer and, while she can certainly hurt an opponent inside, she can also shoot the 3. If she can stretch out Piketon’s in-your-face defense, it may open things in the lane for the Jeeps. The Redstreaks’ main scoring threat inside the 3-point arc is senior Ally Crothers, who’s listed at 5-foot-8. If Cook can negate her in the scoring column, it’s up to Bri Claxon, Baylee Cox and Karli Montgomery to stop Odel and Lightle. One other area the Jeeps must pay special attention to is the turnover margin. Piketon is known for its gritty defense and you can rest assured that coach Brett Coreno’s team will bring their best effort on that side of the ball. In SW’s last regular season game, a loss to Wheelersburg this past Thursday, the Jeeps committed 23 turnovers. That can’t happen Monday if they want their season to continue. One of the most intriguing opening sectional matchups for the entire district will be a much improved Portsmouth squad against the defending district champion Minford Falcons at Valley High School at 8:30 p.m.
Minford finished their regular season a week ago with wins over South Webster, Northwest, and Waverly while Portsmouth travelled on the road and picked up a win over Gallia Academy. How Minford guards Portsmouth’s leading scorer and point guard Jasmine Eley will be one of the key matchups to watch from this game. Eley is one of the best scorers in the county with her ability to beat you off the dribble and hit outside shots. For Minford, the best course of action would probably be to guard her with one of the best on and off ball defenders in the county in Livi Shonkwiler. Portsmouth is very guard oriented, and therefore lack the size of someone like Minford senior center Ashley Blankenship. How the Trojans attempt to slow down and limit Blankenship will be another story to watch from this sectional. If there’s one thing for certain, Portsmouth coach Amy Hughes will have a game plan devised for her team to put them in the best possible situations to win. And after having a week to prepare for a much improved Trojans squad, Minford coach Shane Davis will have his team ready to compete as they hope to repeat as sectional and district champions in 2019. Another uber-intriguing matchup in sectional play pits two conference foes against one another, the Glenwood New Boston Tigers and the Eastern Eagles on Monday at Northwest High School at 7:00 p.m. If you don’t think New Boston isn’t one of the most improved teams in their district, check the results of their two regular season contests with SOC I foe Eastern. In their first matchup nearly two months ago in Beaver, Eastern rolled to a 39 point victory in a game that was never close down the stretch and which saw four Eagles break the double figure mark. Just over a week ago in the Tigers and Eagles most recent matchup, it was New Boston who won the rematch on their home court 49-45. That’s 43 point turnaround from their matchup in December which speaks volumes to the amount of effort they’ve put in. With numerous scoring options in Sammy and Lexus Oiler, freshman Kenzie Whitley, Shelby Easter, and Taylen Hickman, the Eagles will need to find away to limit the Tigers open looks and keep them off the offensive glass. For New Boston to walk away with a sectional win, they will need to do one of the things they do best on the defensive end: create turnovers with physical, smart defense. If they do that and limit the Eagles production offensively, they’ll set themselves up with a date with fellow SOC I foe Notre Dame in the sectional final.